North Central (middlebelt); Saxony; Accra, Bawku; Windhoek, Erongo; Johannesburg. 1. Climate protection and biodiversity conservation for sustainable use and enhanced livelihood with specific interest in how Climate change would impact genetic diversity and the distribution of flora. 2. Biodiversity and policy: To support the incorporation and application of scientific research findings to drive administrative and policy decisions. 1. Five to six years of experience in the applications of plant tissue culture and molecular biology techniques including DNA isolation, microsatellites and DNA amplification, Agarose gel electrophoresis and DNA sequencing gain through work and studies in Nigeria and Germany. 2. Experience with biodiversity conservation related fieldwork and species distribution modelling. 3. Good communication, scientific writing and grant application skills. Author to some interesting scientific papers and co-authored a book chapter. 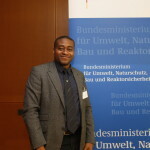 [2015 till date]: DAAD postgraduate scholarship, Leipzig University, Germany. Current research: Climate change impact on genetic diversity and distribution of Senegalia (Acacia) senegal in sub-Saharan Africa. : University of Reading, UK. • Our changing climate: Past, present and future, Nov- Dec, 2015.
: RBG, Kew & Natural Environment Research Council, London, UK. • Applied plant taxonomy, identification and field survey skills course, September to October 2014.
: Alexander von Humboldt Foundation (AVH), Germany. • Fellow, International Climate Protection and Resource Conservation, August 2013 to November 2014.
: International Foundation for Science (IFS), Accra, Ghana. • Capability Enhancing Support Workshop on Collaborative Research into Neglected and Underutilized Species (NUS)” July 2013. [: International Center for Genetic Engineering and Biotechnology, Trieste, Italy. • Theoretical and Practical Course “Bioinformatics: Computer Methods in Molecular and Systems Biology'' June 2012.
: Preston Montford Field Studies Centre, Shrewsbury, UK. • Darwin Scholarship Programme on “Monitoring and communicating biodiversity”. August to September 2011. Center for International Postgraduate Studies of Environmental Management (CIPSEM), Technische Universität Dresden. Federal Republic of Germany. • 50TH UNEP/UNESCO/BMU International Short Course on “Nature Protection and Conservation of Biodiversity” for Developing and Emerging Countries (SC 50), September to October 2010. Consortium for the Barcode of Life (CBOL), Washington DC in conjunction with the University of Johannesburg, Auckland Park, South Africa. • DNA Barcoding Techniques and Grant Writing Application, January 2009. May 2008 to 2015: Senior Scientific Officer: Biotechnology Unit, National Center for Genetic Resoures and Biotechnology (NACGRAB) Ibadan, FMST, Nigeria. 1. Applications of in vitro protocols for mass propagation of tropical crops/plants. (Plant tissue culture technique and Temporary Immersion Bioreactors). 2. Ex situ and in situ techniques in Plant Genetic Resources Conservation. • offer training to NYSC members and Industrial trainee students. • Branch Secretary (2012-2015): Academic Staff Union of Research Institutions (ASURI).